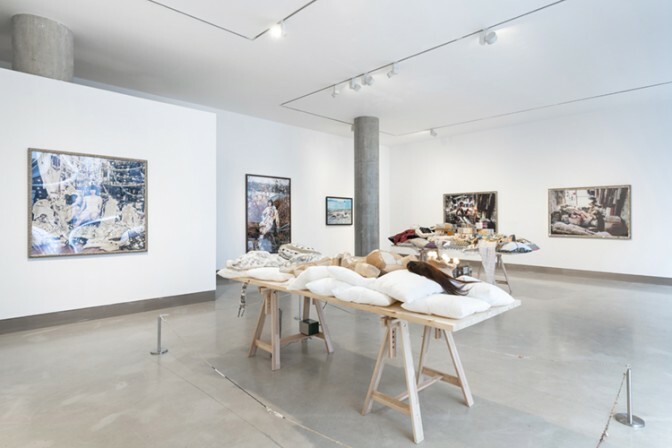 Mari Katayama, Installation view of 'Broken Heart' at White Rainbow, London, 2019. © Mari Katayama. Courtesy White Rainbow, London and rin art association. Photography: Damian Griffiths. White Rainbow is proud to announce Broken Heart, a solo exhibition of photography and sculpture by Japanese artist Mari Katayama (b. 1987, Gunma, Japan). This is the artist’s first UK solo show. In her arresting and visceral work, Katayama’s body features prominently, surrounded by intricately arranged objects, in intimate settings or set against vast landscapes. Born with various physical develop- mental challenges, Katayama had both legs amputated at age nine and has since lived with prosthetics. Using her body as a living sculpture, she photographs herself among intricately embroidered, hand-sewn objects and her prosthetic legs. Investigating issues of beauty, frailty, sensuality, femininity, vulnerability and characterisation of her physicality as less-able bodied. Katayama’s artistic practice is shaped by her direct experiences of her condition and societies obsession and anxieties about bodily appearance. 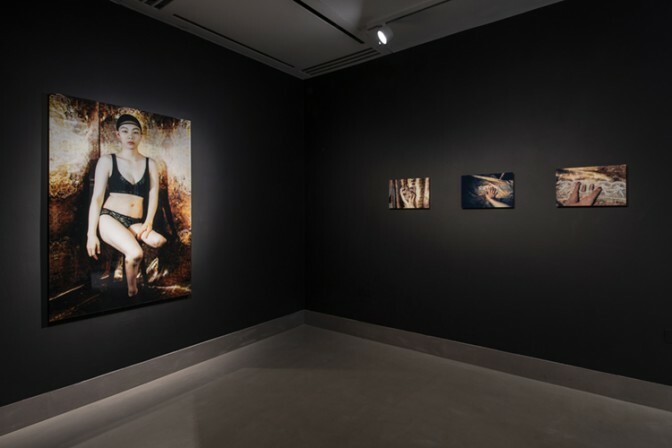 Her striking work does not solely focus on disability itself, or the representation of the female body, but rather embodies the challenges brought about by her condition and wider perception of disability, in relations between the self and others. 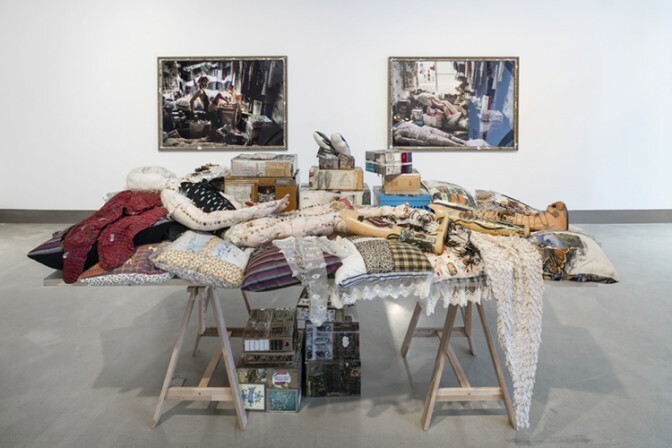 In Katayama’s evocative, self-portraits and embroidered textile sculptures the artist attempts to objectify her own physical condition by constructing an alternative narrative around the image of the stigmatized body. Using her body as the site where representations of difference and identity are inscribed, Katayama explores the tensions between her lived bodily experiences and the cultural meanings inscribed on the female body. Exposing the challenges ascertaining to her physicality and identity, by forcefully pulling the viewer into staged scenes or events, where fixed historical, social, and cultural norms are exposed as ideals to be challenged and redefined. At the centre of Katayama’s White Rainbow exhibition are a series of works produced between 2011- 2016. Katayama’s early artistic practice is represented by the works I’m wearing little high heel and I have child’s feet (2011). Photographed in the self-contained world of her teenage bedroom, among child- hood prosthetics and handmade garments long since outgrown. 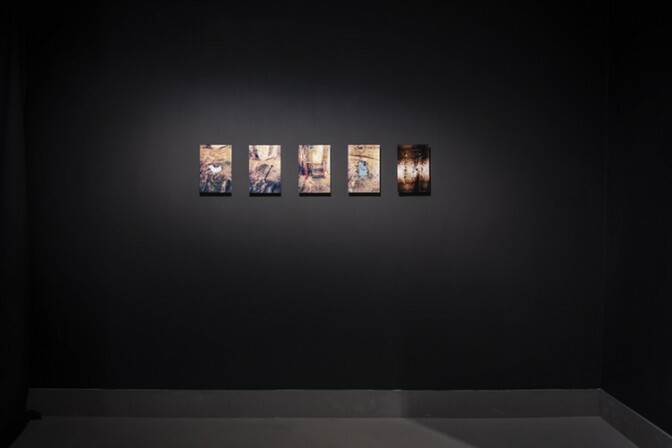 Katayama alludes to the memories of isolation she felt whilst growing-up and her ongoing state of vulnerability and separation, due to perceived differences that set her apart. 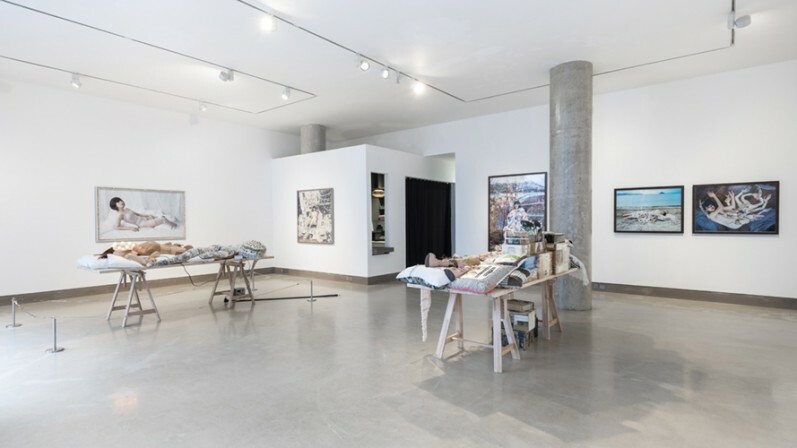 In the later self-portraits you’re mine (2014), Katayama stripped to her undergarments, reclines against a backdrop of white fabric and cushions. Taking cues and inspiration from art history, the prevalence of images of the female body. The romantic cliché of the title and play on the conventions of the representation of the idealised female form, prompts us to consider the forces shaping ideals of physical beauty and normality, and the reality of Katayama’s own anatomy. The reverence to perfection ridiculed and problematised by exposing the frailty of the human body and the apprehension about harm, pain and deformity. In the related sculpture, a plaster cast mould of Katayama’s body is covered in a hand-sewn patchwork of leather, a second skin. Katayama’s face replaced by the reflection of the viewer, a mirror to the historical, social, and cultural construct that is oneself. Posing the question Who I am? as well as Who are you? In shell (2016) we see Katayama, standing alone with a piercing gaze directed at the viewer amidst hand-sewn mannequins, disused prosthetic legs and an array of objet d’art rich in ornamentation of her own time-consuming labour – cutting, pasting, sewing, pattern-making. The carefully embroidered anatomical torsos and interchangeable disembodied body parts functioning as symbols of Katayama’s story. The pain and discomfort undergone, and her sensitivity to the body and the limbs that have been amputated. A cocoon-like world in which the image of a fragmented body and the phenomenon of the phantom limb, is deeply sensed. bystander (2016) and on the way home (2017) is a further series of striking photographs conceived by Katayama whilst artist in residence on the island of Naoshima in the Seto Inland Sea south/east of Japan. Inspired by Naoshima Onna Bunraku, a traditional puppet theatre practice that is performed exclusively by women from the Naoshima region. For these works, Katayama photographed the hands of members of the all-female traditional puppet theatre group, printing them onto material and crafting them into a many-handed doll. Against the backdrop of a natural landscape the vastness of the sea, Katayama alludes to the mythological beauty of Venus, or Aphrodite and appears herself to be born of the sea. The tentacle-like arms and hands that have become her own limbs, repairing the fragmented image of her body, one rebuilt by borrowing those of various others. In her most recent photographic series cannot turn the clock back (2017), Katayama continues to explore the numerous challenges ascertaining to her physicality and identity. Here though Katayama’s conversation with the body through her art represents an even bigger turning point in her life, that of motherhood. Encapsulating how her lived experience is shaped by her condition against the dominant discourses that less-able bodied women who desire children are thought to be selfish or unrealistic. This series of works offer a poignant reflection on the physical challenges and psychological fears Katayama faces as a mother, nurturer and protector of a young life. Along with the anxieties surrounding familial and human relationships, love, pain and memory of her own childhood that motherhood bring. 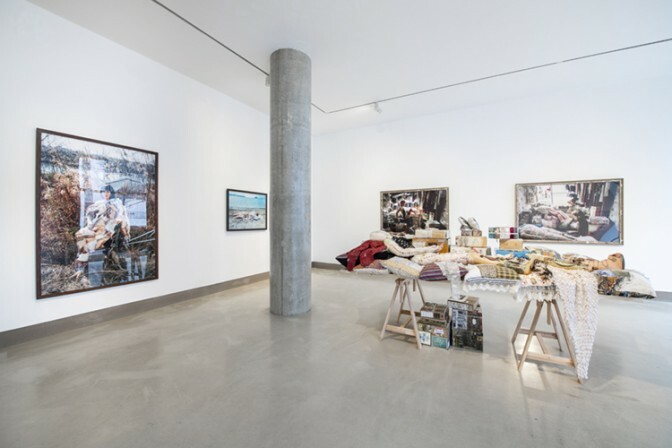 Broken Heart concludes White Rainbow’s 2018/19 programme which has included exhibitions by Chikako Yamashiro, Chim↑Pom, Aki Sasamoto, Taro Izumi, Meiro Koizumi and Mari Katayama. In the photographic self-portraits of Mari Katayama (b. 1987, Gunma, Japan), the artist’s body features prominently, surrounded by painstakingly arranged objects, both in intimate settings or set against vast landscapes. The recipient of the Grand prize at Art Award Tokyo Marunouchi 2012, Katayama was born with various developmental challenges, and had both legs amputated at age nine and has since lived with prosthetics. Using her body as a living sculpture, Katayama photographs herself among intricately embroidered objects, hand-sewn mannequins and her prosthetic legs.